After spending over a week on the surface of Mars, the NASA Probe ‘Spirit’ has expressed its gratitude for being sent on such an important mission and is glad it is amongst the very few to be successful and make it to the planet in one piece. Following the loss of the British Beagle 2 lander the difficulty of landing a probe on Mars was fresh in everyone’s mind and when Spirit relayed the images showing it had landed successful NASA was jubilant and a small impromptu celebration was thrown in Mission Control. Spirit is set to be joined by its twin rover, Opportunity, in less than 2 weeks time. Spirit had little to say on the issue. “The Welcome Home Party! !” was the response given, and Spirit continued to explain, “If Dave got that drunk on an impromptu party in the alcohol free zone of Mission Control I can’t wait to see how drunk he gets down at the local nightclubs in Houston. 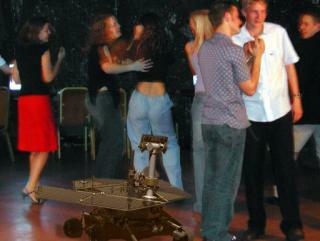 I was so looking forward to it that the NASA artwork boys made an artists impression of what the party would be like. The Spirit probe was looking forward to its welcome home part so much it had the NASA artists create an artisits impression of what it would be like.